At the Church Vicki and I attend, the Pastors are husband and wife. They are in really great shape. I think they must workout some, but they never really talk about that. They do, however, talk about the Green Smoothies they consume every morning, and how doing so for the past several months has made them feel terrific (they look terrific too). They also described how they start every day with a large glass of warm water with the juice of a full lemon mixed in. Something to do with alkaline and pH levels in the body. The sermon they preached two weeks ago was all about the importance of being healthy. In order to build on their point, they demonstrated how they make their Green Smoothies and explained how easy it can be for rest of us to do the same. It was actually a video presentation that they shot in their kitchen. They have this “Ginormous” blender that looks like it could liquify a brick if you ever wanted to liquify a brick. In the presentation they discussed how easy it is to shop for all the ingredients at Whole Foods Market. They then laid out some of the ingredients on the table. 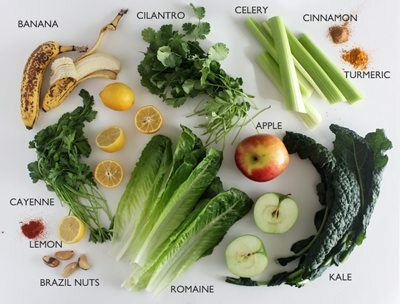 Those piles of ingredients didn’t look too bad….but then it was revealed that those piles contained just the “Green Stuff” for the Green Smoothie. It was at that point in the presentation that they started pulling out more ingredients from a very large drawer. Out came the hermetically sealed plastic bags of several different protein and fiber powders along with a few bottles of different types of oils and some jars of spices/herbs. Just a portion of all the ingredients are in this picture below. As soon as they had all the “stuff” out on the counter, they started to add them to the “Mr. Big” blender. All the big stuff first, then a pinch of this and a cup of that and a cup or two of water (gotta stay hydrated). They then topped it off with a half teaspoon of Cod Liver Oil. The banana and apples were supposed to knock out the oil taste we were told. They do this every day and, as I said, they look and feel great. They have decided that this was important to them and their health and have been disciplined enough to make it a habit. My first reaction after watching what I thought was an enormous undertaking in the preparation and execution of the making of the Green Smoothie was, “Man, that is a ton of stuff to buy, a huge amount of work and, most importantly, an even huger (is that a word?) amount of commitment”. Does that sound like you? Do you want to (or think you should) get involved in a golf specific fitness program but it looks overwhelming? I’m sure we can all agree that drinking a Green Smoothie made with all those ingredients every day would be incredibly good for us and might be the healthiest thing we would consume. But if you don’t commit to it, I mean fully commit, you will most likely drop the process after a short period of time. I think the same is true regarding a Golf Fitness Program. If you are dedicated and commit to a complete structured golf fitness program (like many of the PGA Pros who can afford to hire personal trainers) it would not only help you to feel better overall, but your golf game would surely benefit. The thing is, very few of us have the time, the resources, nor the mind set to undertake such a huge commitment. So, how about I help you get started with a warm water with lemon approach to a simple “Golf Specific” Exercise program that will take you only THREE (3) Minutes a day? Yep, just three minutes a day. I can hear some of you know…”How can three minutes a day do anything, really?” I can guarantee that three minutes a day will begin to help your golf pH level (metaphorically speaking). It’s a start. Then, when you start seeing results you can always think about creating your own golf Green Smoothie program (metaphorically speaking). Click Here to view the 3 Minutes A Day Videos.